In SAP Simple Finance, G/L accounting is used to ensure financial data and statements are correctly entered. It provides you with a financial statement in compliance with legal requirements of the country. Using SAP Fiori Launchpad, you can compare the balances as well as credit and debit amounts in a fiscal year, to display data in different currencies for the cross fiscal year. You can also perform comparison of data for the current year with previous fiscal years, or you can also export the list to CSV file. You can directly open this app from Fiori Launchpad as shown in the following screenshot. When you implement this app, you have to ensure that your system landscape has been set up to enable SAP Fiori. The front-end components and back-end components for your app are already available in this system landscape. You have the option to check the balances and perform a comparison. You can also select Currency from the dropdown list. To view the G/L Account balances, click the Go button once you select all the details. 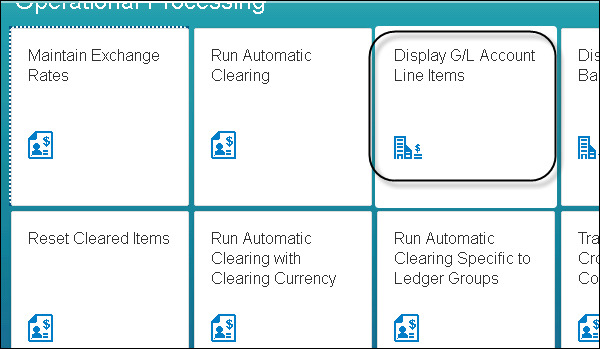 From this app, you can also call another transactional app in Fiori Launchpad – Display G/L Account Line Items. This app can be used to check G/L account line items. You have an option to apply filters whether an app should display open and cleared items or all of the items for an account. The display line items depend on the ledger to be posted. In case of using SAP JAM, a link to this app can be created with the filter condition and automatically posted to Jam or you can also send the link via email.